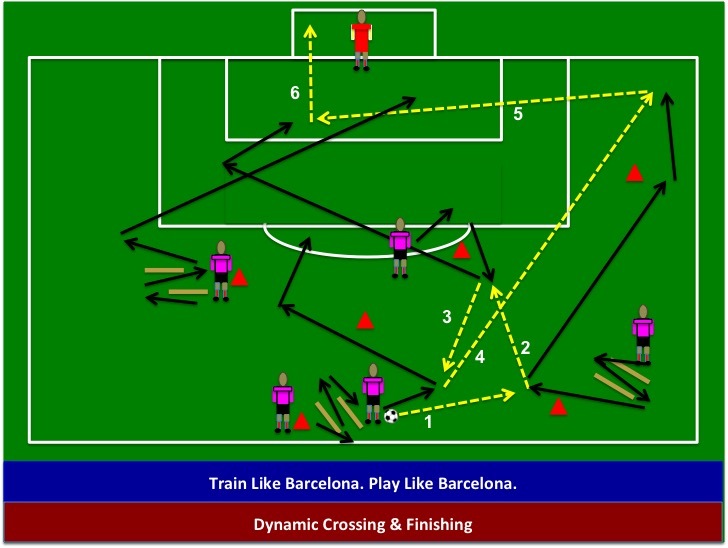 Barcelona Dynamic Crossing & Finishing: My New Book ” Train Like Barcelona. Play Like Barcelona” – Coming June 20th! This crossing and finishing exercise involves dynamic movements into the sequence of passing, crossing and finishing. The picture shows sticks that the players shuffle through but the use of mini-hurdles, speed rings, speed ladder, cones and more can be worked into the exercise to train the players. Players rotate forward one position after finishing. Previous Post Don’t Forgot To Teach This When Playing Rondo! This One Key Point Will Change The Way You Coach!